How much the village had grown has not been possible to find out, but probably, in spite of the rebuilding, not a great deal. As yet there was no real heart to the village. The ten houses and cottages already described lay dispersed along the edges of the commons and not far way from the brook or one of its tributaries. In the eighteenth century this changed and the area now thought of as the old village became the centre of the community for the first time. 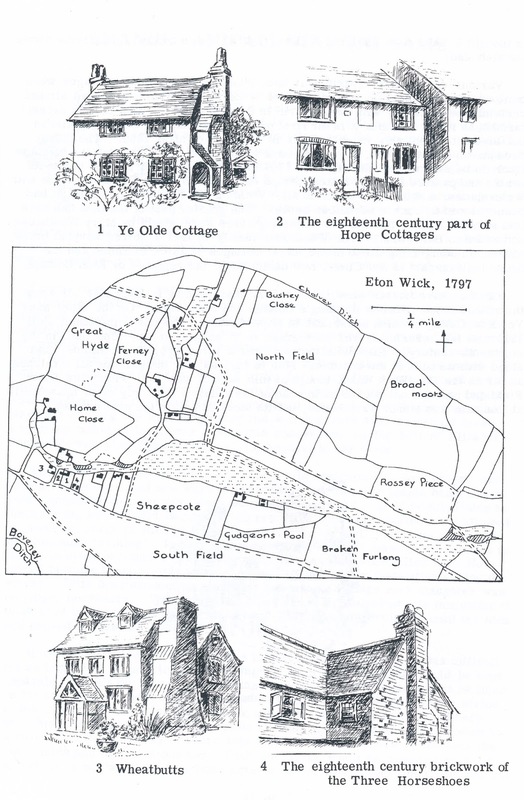 A parish map of 1797 (itself a copy of an older one of 1742) shows about ten cottages in the short stretch of common from Wheatbutts to Sheepcote, while in the rest of Eton Wick, to the east, north and west there were only about another dozen, and most of these were the older timber-framed houses. Two of these houses can be dated with reasonable certainty as having been built within the first quarter of the eighteenth century - Wheatbutts and Hope Cottage (now part of nos. 37 and 39 Common Road). Wheatbutts was built for William Lyford, a butcher from Eton, between 1704, when the land was described as 'all that close of arable land called Wheatbutts', and 1716; by which time the house had been built in the corner of the close and the rest converted into an orchard. Whether William Lyford ever lived there is not clear, but by 1716 he was living at Old Windsor and the property sold to the Eton Poor Estate. Hope Cottage was built a few years later in about 1725. At that date a small close of just over an acre was bought from William Lyford by Anthony Warwick, a yeoman of Eton. It seems unlikely that he ever lived there, for he owned several cottages including five in Dorney, and when he sold his cottage in Eton Wick in 1732 to Elizabeth Griffin, a widow, she was already living there. She and her married son, William, converted it to an alehouse known as the Bull's Head. Probably about this time the cottage was divided into two. William bought the property from his mother in 1745 and continued to be the victualler there for the next eleven years. It takes little imagination to conjure up the convivial and perhaps drunken scenes spreading out on to the common. Three years, however, before the sign of the Bull's Head was finally removed for ever, William sold the property to a husbandman of the Wick, John Fennel. John's widow, Elizabeth, continued to live there until her death in 1785, and from her will we learn a little more about the property. She left one of the cottages to her niece, Anne Hope, from whom it seems the cottages took the name by which they were known until recently. At the time of Elizabeth's death this cottage was the home of Robert Tarrant. The other cottage, in which Elizabeth herself had been living, she left to her kinsman, Robert Wilkins, and his wife and son, for their lives. To Anne Hope she also left a green iron bedstead and her furniture: to Anne Hope and Mary Wilkins together she left the rest of her goods and chattels. Even before the Bull's Head had closed its doors another alehouse had opened in the village. This was the Three Horseshoes. Exactly when it received its first licence is unknown but, like the Bull's Head, it is recorded in the Victuallers' Recognizances of 1753. The house itself was built sometime before 1705 when it was purchased by Joseph Johnson, yeoman of Eton Wick, from John and Mary Bell. 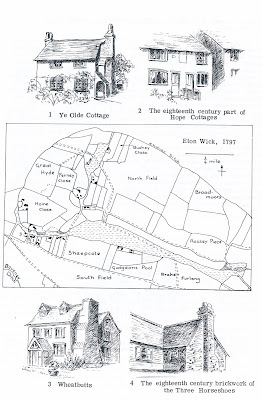 It is intriguing to speculate which of these two inns was the first in the village, though it is possible that neither was as is suggested by an isolated reference in the parish registers to 'The Small Fox' at Eton Wick. Perhaps the village simply could not support two inns. In spite of being built within a short time of each other, these three houses were very different. The Three Horseshoes still retains its original L-shape though much alteration has taken place and only a very small area of the pleasant red and blue brickwork that was so popular in this part of the country can still be seen. Its first-floor windows are probably original. Wheatbutts was built as a substantial small cottage with two rooms on each floor and the dormer windows made it possible for the roof space to be used as an attic. The front of the house is of brick with a symmetrical arrangement of door and windows which was then fashionable, but the back displayed a timber-frame. The closely spaced, vertical studs until recently could still be seen within the house though countless layers of whitewash and plaster had disguised their thickness. Hope Cottage was rather larger with four rooms on each floor but with no attic. It had a central chimney, and during alterations the huge beam above the fireplace in no. 37 and a bread oven to one side were revealed. Originally there was also probably a symmetrical arrangement of door and windows and a centrally placed staircase, but when the cottage was divided the window which had lighted the stairs was blocked and new doorways must have been made. Sadly none of the eighteenth century brickwork can now be seen on the exterior of these cottages, for they and the adjoining nineteenth century ones have been encased in a twentieth century brick shell. Inside much of the original construction still remains including a low doorway in one of the bedrooms of no. 37 which is thought to have once led from William Griffith's own cottage to the room above the alehouse. Various deeds show clearly that both Wheatbutts and Hope Cottages were built on land that had once been part of Wick Farm. This farm can almost certainly be identified with Dairy Farm in Common Road. How old the present farmhouse is, or whether it is the first on this site, has not been established but since it is entirely brick-built it is likely to b6 after 1650. The oldest deed known is dated 1704, but refers back to previous owners so that the house is likely to be seventeenth century. In 1704 the farm consisted of five closes of arable and pasture land and sixteen strips dispersed in North Field, the Hyde and Waterslades, making forty acres in all. Within a few decades, however, it had been reduced to a mere seventeen acres. The greater part of the land had been lost to other farms. In 1776 the remaining acres were bought by Mary Woolhouse and added to Bell Farm. The Woolhouse family in fact acquired several properties including Long Close house, other cottages by Little Common and the house built on part of Nut Close, now demolished, but replaced by Eton Cottage. Of the other houses shown on the 1797 map nothing is known at all about those that stood between Harding's Cottage and Sheepcote. On the other hand Ye Olde Cottage, which stood next to Hope Cottage, was not demolished until 1951 and the description and photograph of it suggest it was also built in the eighteenth century. Like Wheatbutts it had a large projecting chimney and stood with its back to the common. This is curious, for the gardens all stretched as far as the Eton Wick Road, though at this date it was still within the South Field and perhaps not yet the main road of the village. The only other house built at this date was Manor Farmhouse.